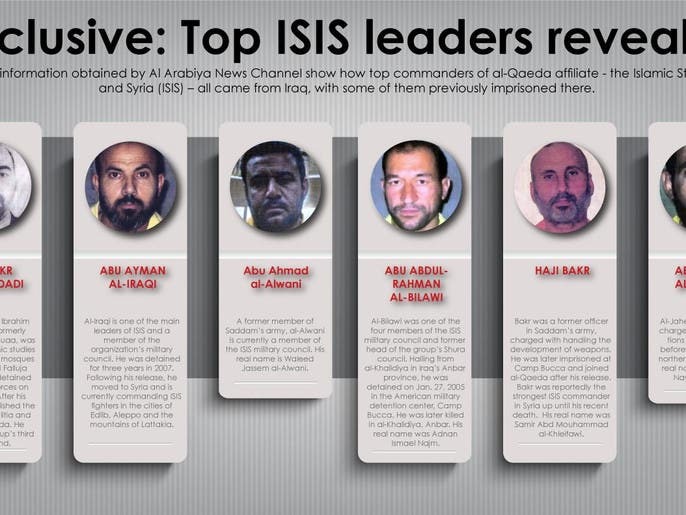 Exclusive information obtained by Al Arabiya News Channel has revealed the identities of the top field commanders running the Islamist militant group known as the Islamic State of Iraq and Syria (ISIS). The six individuals who have been at the helm of the terror group are from Iraq, Deputy Minister of Iraq's Interior Ministry Adnan al-Asadi told Al Arabiya in an exclusive interview to be aired on Friday. At least three of them served in Saddam Hussein’s army while others were previously detained in Iraq and upon their release they joined the war in Syria. His real name is Ibrahim al-Badri, also formerly known as Abu Douaa, was a lecturer of Islamic studies and an Imam at mosques in Bagdad and Falluja before he was detained by American forces on June 4, 2004. After his release three years later, he established the “Sunni Army” militia and joined al-Qaeda. 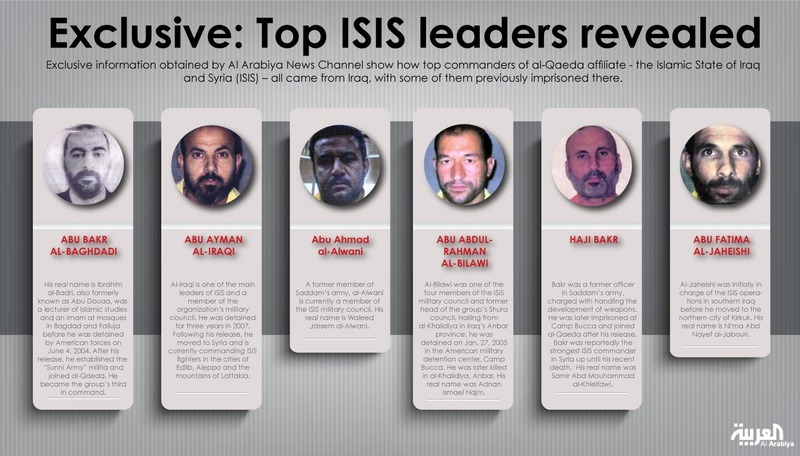 He became the group’s third in command following the death of Abu Omar al-Baghdadi. Al-Iraqi is one of the main leaders of the Islamic State of Iraq and Syria (ISIS) and a member of the organization’s military council. He previously worked as a colonel in Iraq’s air defense intelligence under Saddam Hussein, during which time he was nicknamed Abu Muhannad al-Suweidawi. He was detained for three years in 2007. 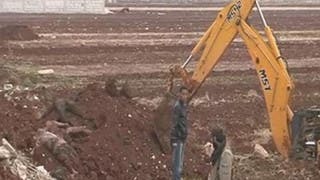 Following his release, he moved to Syria and is currently commanding ISIS fighters in the cities of Edlib, Aleppo and the mountains of Lattakia. A former member of Saddam’s army, al-Alwani is currently a member of the ISIS military council. His real name is Waleed Jassem al-Alwani. 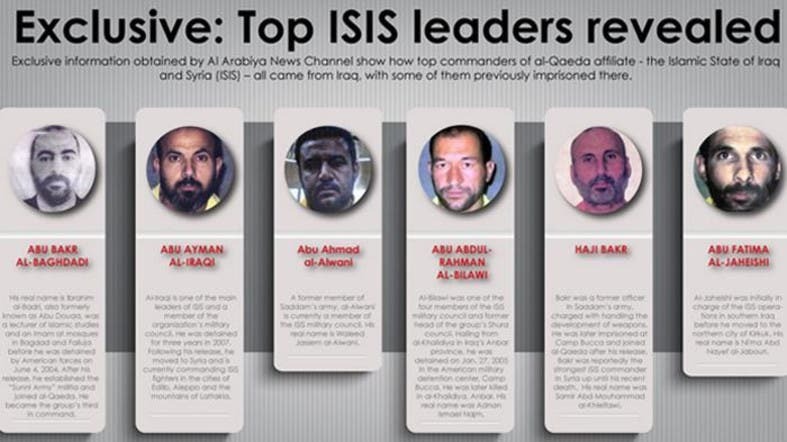 Al-Bilawi was one of the four members of the ISIS military council and former head of the group’s Shura council. Hailing from al-Khalidiya in Iraq’s Anbar province, he was detained on Jan. 27, 2005 in the American military detention center, Camp Bucca. He was later killed in al-Khalidiya, Anbar. His real name was Adnan Ismael Najm. Bakr was a former officer in Saddam’s army, charged with handling the development of weapons. He was later imprisoned at Camp Bucca and joined al-Qaeda after his release. Bakr was reportedly the strongest ISIS commander in Syria up until his recent death. His real name was Samir Abd Mouhammad al-Khleifawi. 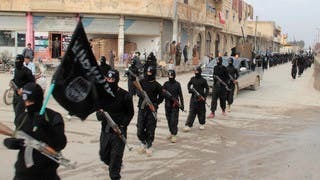 Al-Jaheishi was initially in charge of the ISIS operations in southern Iraq before he moved to the northern city of Kirkuk. His real name is Ni'ma Abd Nayef al-Jabouri. The Islamic State of Iraq and Syria (ISIS) had claimed responsibility for a brazen attack on Abu Ghraib and Taji prisons on July 22, 2013 that led to the escape of hundreds of militants, many of whom were members of al-Qaeda. A government statement pointed to collusion between jail staff and the militants who attacked the jails. Several months after the incident, questions linger about how a handful of armed men could break into Iraq’s most guarded prisons without the help of the security services working for Prime Minister Nuri al-Maliki, a staunch ally of Iran and the Assad’s regime in Syria. 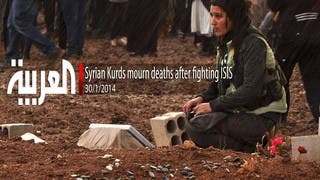 Recent reports have also established links between ISIS and the Syrian regime. 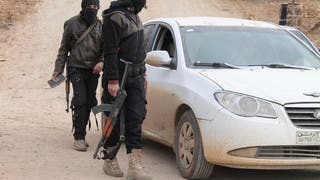 According to documents revealed by the Syrian National Coalition, several field commanders of the al-Qaeda affiliate were former military or intelligence officers of the Syrian army. These commanders have been coordinating military operations with the Assad’s forces, providing them with information about rebel fighters and facilitating the recapture of areas previously controlled by the rebel Free Syrian Army. Rebel raids on ISIS camps turned out further corroborations on the alleged ties. Similar weapons and ammunition used by the Syrian regime forces were also found at the al-Qaeda camp in Raqqa province, according to opposition sources.